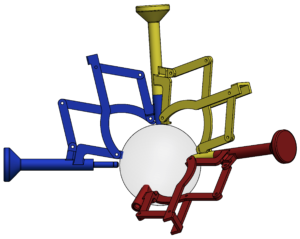 A Variable Topology Truss extends the class of variable geometry truss robots by allowing them to rearrange the way their truss members are connected to each other. This increases the versatility of the robot; it can adapt its topology to match the required task. For example, we envision a VTT system used in a disaster response scenario. First, the VTT would be transported to the disaster site in a compact storage configuration. The VTT would reconfigure into a walking or rolling topology and move into a collapsing building. Then, the VTT would reconfigure into a shoring structure to support the building, preventing further collapse while first responders search for survivors. Once the search is complete, the VTT could extract itself and move on to the next building. A Variable Topology Truss consists of many identical modules that correspond to the members in the truss. Each module is a linear actuator with a spherical joint on both ends. 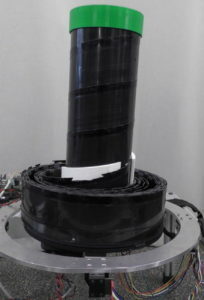 For the linear actuator we use the Spiral Zipper, a novel linear actuator designed in ModLab. For the spherical joint, we use a new joint which allows a series of joints to be chained together around a common center of rotation. The Spiral Zipper and a rendering of three VTT joints at a node. The Spiral Zipper zips together a spool of toothed band to form a rigid column. It is capable of an arbitrarily large extension ratio depending on the amount of band used. We have demonstrated up to 15:1 extension. It also has a high strength-to-weight ratio under compression loads. The VTT joint is similar to the concentric multilink spherical joint used on the Tetrobot robot, with the additional capability to allow two truss nodes to merge into a single node, or a single node to split into two nodes. To provide the conditions of a truss, the joint does not support moments, it only constrains truss members to rotate about the center of the node. In our published work, we have shown that at least 18 member modules are required for topological reconfiguration. At this time, we have characterized the reconfiguration capabilities for all VTTs with fewer than 24 members. This allows us to determine what sequence of actions should be taken to reconfigure from one truss topology to another, or if no such sequence exists. A. Spinos and M. Yim, “Towards a variable topology truss for shoring,” in Ubiquitous robots and ambient intelligence (urai), 2017 14th international conference on, 2017, p. 244–249. A. Spinos, D. Carroll, T. Kientz, and M. Yim, “Variable topology truss: design and analysis,” in 2017 ieee/rsj international conference on intelligent robots and systems (iros), Vancouver, Canada, 2017. Oct 09, 2017 | Filed under Modular Robots and tagged with cdevin, Featured, spinos.